Alternatively, My Little Sister Can’t Be This Good a Card. TL Note: “Soeur” is French for “sister”, so I wouldn’t be surprised to see this card localized as “Puddingsis”. Second TL Note: The romaji for the card is actually PuTinsesuuru – it’s a T, not a D. Most likely, this is a play on “petit”, further lending credence to the “little sister” motif of the card. 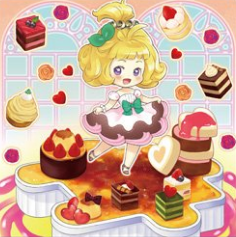 And also to make it not Puddingcess.